Places with pavements that are too clean alarm me. I am used to pigeon-crap splattered floors that have been discoloured by dozens of discarded pieces of chewing gum, spat out then slowly and gently trodden into paving slabs over the years. I am used to frowning and shaking my head at occasional pieces of litter on the floor – or, as was the case in our Nottingham street, entire contents of wheelie bins strewn out for all to see. 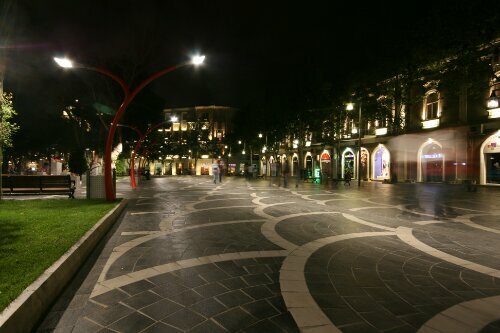 So one of the first thing I noticed about Baku was how clean its streets were. They were not just clean, they sparkled – as if polished by a team of undercover street fairies who dance over them in silk shoes when the city sleeps. And this unnerved me. But then you step into the old town and it feels a bit like a set out of Aladdin. 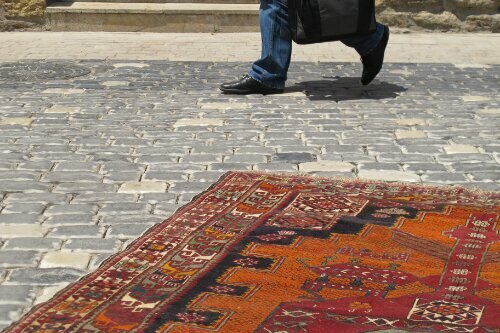 Cobbled pavements are lined with ‘magic carpets’ and little stone doors lead into cave-like shops selling richly decorated fabrics and shiny brass trinkets. But even the odd, cobbled little stones on the ground were very clean. But the prize for the cleanest, most sparkling floor in all of Baku must go to the marble viewing platform. Yes you heard me right, a far cry from the well-trodden floors of the Eiffel Tower or London Eye pods, Baku has a grand, shiny marble staircase (a bit like that one in the Sound of Music house, but this is outside) that leads up to a huge, impressive viewing platform with tremendous views across the city. The floor was so shiny I needed sunglasses to look down. And, to top it off, it was built in honour of Eurovision. As we said our farewells to Baku (via a three-day ferry crossing, but more on that later), I concluded, just as I once did about tablecloths determining the expense of restaurants, that street cleanliness is indeed a clue to a city’s wealth. And that I am more more likely to fall in love with the poorer cousins of the street scene. 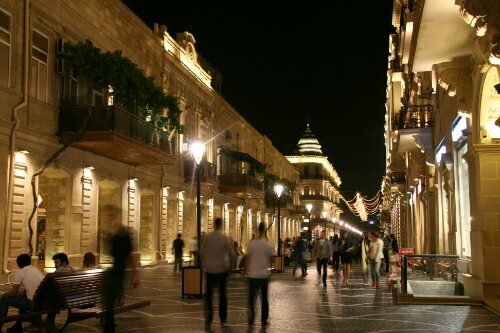 Baku is a very expensive city for budget travellers. 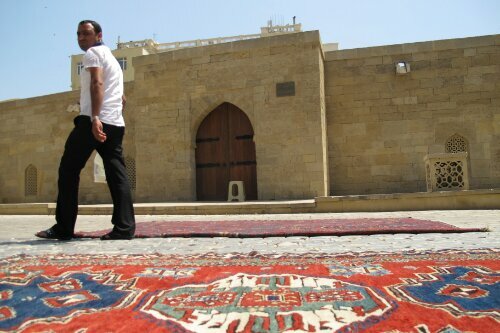 The cheapest accommodation in Baku that we could find, after searching countless websites, was the Caspian hostel. It has a fab location in the middle of the old walled town but was overpriced. It cost 16 manat (about £13) for a dorm bed in a room that was cramped with beds. In saying that it was clean enough and the owner was friendly and helpful. I would also really recommend the old city audio walking tour. It costs 5 Manat, takes about two hours and really brings the old town to life. Well worth it. 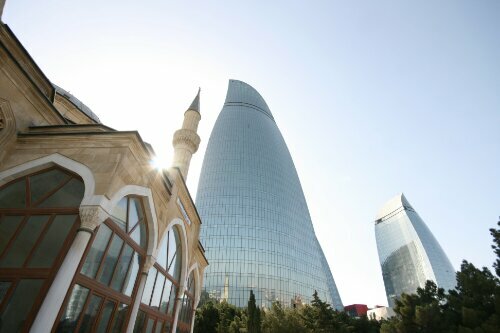 Baku is also great for shopping and makes for an ideal place to stock up before travelling east to Central Asia. 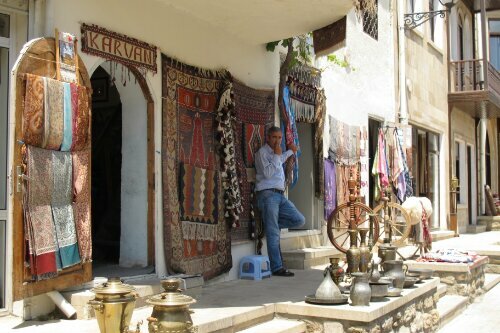 This entry was posted in Azerbaijan, Recent Posts, World in Pictures and tagged City breaks, The Silk Road by Delia. Bookmark the permalink. 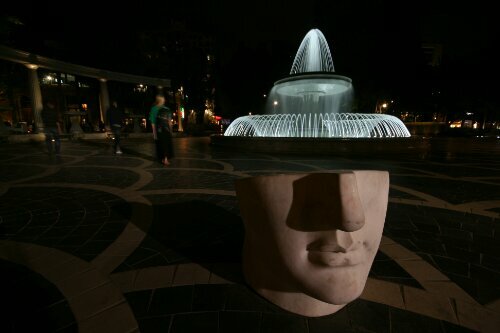 You are opening my eyes to all sorts of wonderful places that I have never given any thought to before. 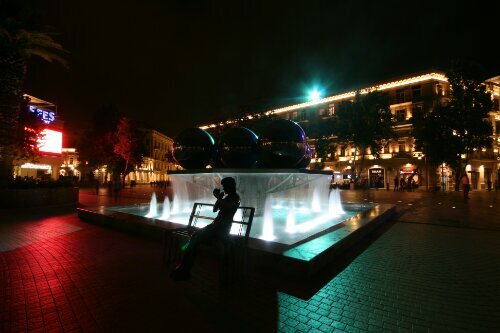 Baku looks amazing – thank you for giving me these insights.